The Lexar® Professional 1000x CompactFlash® (CF) memory card provides ultimate high-speed performance and reliability for professional photographers, with industry-leading 1000x (150MB/s) minimum guaranteed sustained read transfer speed. * The card provides support for high-resolution UDMA-enabled DSLR cameras, lets you capture and store high-quality images and 1080p full-HD and 3D video, and dramatically improves transfer rates when paired with a UDMA-enabled reader. 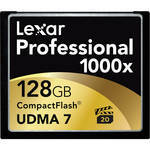 The Lexar Professional 1000x CF card is available in 16GB, 32GB, 64GB, and 128GB capacities. Ultimate Professional-Level Speed and Performance to Dramatically Accelerate Workflow. The Lexar Professional 1000x CF card leverages the impressive, high-speed performance of UDMA 7 technology to provide industry-leading minimum guaranteed sustained read transfer speed of 1000x (150MB/s) or faster. * Performance optimized to leverage the latest photo and video features available in high-end DSLR cameras, it allows you to capture high-quality images and 1080p HD and 3D video, and then transfer from card to computer at blazing-fast speeds. ** This dramatically accelerates workflow from start to finish, so you can get back to the business of photography. Supports the VPG-20 Specification for Professional-Quality Video. The Lexar Professional 1000x CF card supports the Video Performance Guarantee (VPG-20) specification. This means the card’s been tested and guaranteed for professional video capture streams at up to 20MB/s. This enables professional-quality full-HD video capture at high frame rates with no dropped frames. Unmatched Performance, Reliability, and Compatibility. The Lexar team works with major camera manufacturers to ensure all Lexar memory cards are compatible with their digital cameras—from the simplest to the most complex. The cards are also tested in the Lexar Quality Labs, facilities with more than 800 digital cameras and memory card devices, to further ensure compatibility and performance. And all Lexar Professional cards come with a limited lifetime warranty and a free, dedicated customer support line. Designed with professional photographers in mind, the advanced technology and blazing speed of the Lexar Professional 1000x CF card provides ultimate memory card performance. *Minimum 150MB/s read transfer, write speeds lower. Speeds based on TestMetrix certified tester. Actual sustained speed may vary depending on host device.